What a stunning plant it added to my favourites. thank you. It's a large shrub, Morgana, almost a tree! So do I - but this one is a bit sad, as it fell over completely in the gales last year. We heaved it back up and it is tied to a stake! How it survived, I really do NOT know! I like these as well .........it will be gorgeous when it,s in flower ! I know some of us are moaning about too much rain, but when this has raindrops on it, it looks stunning! Thank you Spritzhenry its not only a lovely shrub and colour its interesting to put into a painting too. Looks beautiful! I've learned the moisture probably saves you. This is very invasive in drier climates. What a lovely translation, Terry. That is beautiful, can I have the miniature version when someone breeds it? In Utah this was introduced and it steals all the water from the other species and is taking over. It deposits salt which inhibits any natives from coming back. They are making strong efferts there to eradicate it completely. There are stands of them dead all over where my parents live, where water is short supply and tamarix a big drinker. Greenthumb, that's an amazing fact. Think I just changed my mind! They are beautiful. :-) I wish I could have one. The winter wouldn't do it well. Awww. It does look happy here spritz. You haven't seen the wires attaching it to the stake, Gt!! Yes - we are close to the west coast, so we get the prevalent westerlies. Sometimes, they're very strong! Good info. Greenthumb, Terry and Spritz for the forum, there is a lot of information out there. I do, too - that's why it's attached to a strong stake! I don't want to lose it. 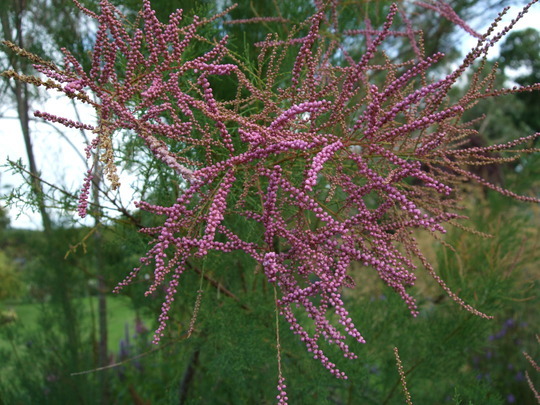 See who else is growing Tamarix ramosissima. See who else has plants in genus Tamarix.